This German Shepherd Police Dog is one of my newest line of occupations and sports. 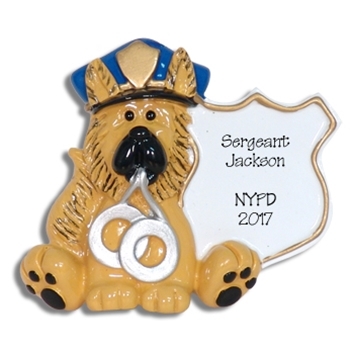 This is a great ornament for any policeman, especially if he is a dog lover or in a canine unit. It is certainly ready for any personalization that you may want to add. Designed by me, he is made from RESIN and hand-painted. Comes complete with hook and satin ribbon for hanging.